Percussionist Brian Blade, who recorded three studio albums and toured extensively with Mitchell, served as Co-Musical Director, providing musical arrangements for the live concert recording with Co-Musical Director, composer, arranger and producer Jon Cowherd. Rachel Moore, president and CEO of The Music Center said, "By honoring Joni Mitchell, an amazing iconic artist, The Music Center had an incredible opportunity to bring her music to Los Angeles audiences. 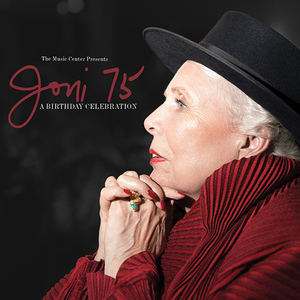 Now that experience can be enjoyed by many more Joni Mitchell fans with an album that allows other music legends to shine a light on her artistry." The concert will be broadcast in theaters nationwide by Trafalgar Releasing on February 7. Tickets can be purchased at www.joni75.com. With nine Grammy awards and 16 Grammy nominations to her name, as well as a catalogue of music that spans more than five decades, Mitchell is a music icon whose work continues to inspire generations of artists. In 2017, Mitchell's 1971 album Blue was named number one on National Public Radio's list of the 150 greatest albums made by women. Her work has no boundaries and crosses genres from Folk and Pop, to Jazz and World Music. Decca is one of the world's iconic record labels. The logo has been associated with some of recorded music's defining acts: The Rolling Stones, David Bowie, Luciano Pavarotti and Ella Fitzgerald, to name a few. Decca is also home to such diverse and distinctive artists as Andrea Bocelli, Rod Stewart, Gregory Porter, Melody Gardot, Aurora, Ludovico Einaudi, Imelda May, Alfie Boe, The Lumineers and Sheku Kanneh-Mason. In the United States, it is operated out of Verve Label Group / Universal Music Classics, US. The Music Center convenes artists, communities and ideas with the goal of deepening the cultural lives of every resident in Los Angeles County. The non-profit performing arts organization has two divisions: The Music Center Ops, which manages The Music Center's four theatres, an outdoor plaza and Grand Park on behalf of the County of Los Angeles; and The Music Center Arts, which curates a world-class dance series, Glorya Kaufman Presents Dance at The Music Center; produces and presents programming in other arts genres with a focus on engagement; and presents nationally recognized arts education programs. The Music Center is also home to four renowned resident companies – Center Theatre Group, the LA Master Chorale, LA Opera and the LA Philharmonic. With The Music Center On Location,™ the non-profit performing arts organization brings events and activities to locations outside of its Downtown Los Angeles campus. The Music Center also programs and manages Grand Park, a 12-acre adjacent greenspace, with year-round free programming. For more information, visit musiccenter.org Follow The Music Center on Facebook, and follow @MusicCenterLA on Instagram and Twitter.